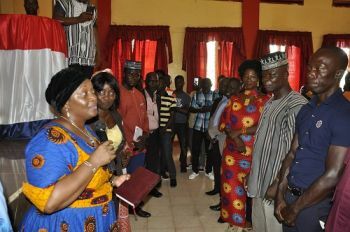 Monrovia, Liberia - Vice President Jewel Howard-Taylor wants local government officials to prioritize a participatory approach in promoting government development programs and policies in the counties. Vice President Jewel Howard-Taylor said, for the government overall pro-poor development agenda to be a success, citizens’ involvement must be given keen attention across the country. 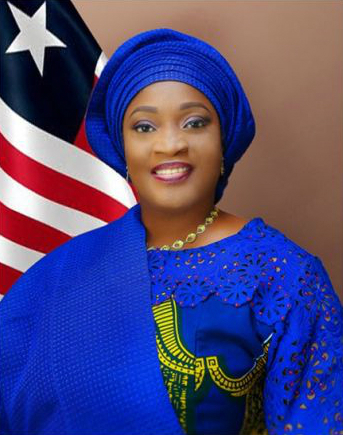 According to a release from the office of the Vice President, she made the statement Wednesday, May 24, 2018 at programs marking the induction ceremony of local county officials for Bong County including the Assistant Superintendent for Development, County Inspector, City Mayor and Statutory Superintendent of Kokoyah District among others. She said with Liberians divided on political, ethnic, religious, cultural, class, and ideological lines couple with government’s plan for transformation through effective decentralization processes , it was now imperative that local leaders involve their people to support modern development programs and reforms. Vice President Howard-Taylor pointed out that citizens’ participation in all aspects of the President George Weah’s pro-poor development agenda will profoundly impact the lives, wellbeing and happiness of the Liberian people for generations to come. She asserted that while Liberia is now in a new dispensation, it is the responsibility of every Liberian in both the public and private sectors to get actively involve with the development process, with the aim of resolving the daunting national challenges facing the country. Meanwhile, Vice President Jewel Howard-Taylor has provided fifteen brand new Safari motorbikes to the local leadership of Bong County. The motorbikes, according to Vice President Howard-Taylor will be used by the 13 administrative district commissioners, Relieving Commissioner and the County Inspector. Presenting the motorbikes to the Chairperson of the Commissioner Council of Bong, Mr. Milton Varney and County Superintendent, Madam Esther Walker in Gbarnga, Vice President Howard-Taylor said, an effective local government structure in the counties was critical to achieving government over all development programs. Vice President Howard-Taylor said the George Weah-led government is also working through different initiatives to make similar donations to other counties. She encouraged the District Commissioner to effectively use the motorbikes in serving their people and resist acts that would undermine the government pro-poor agenda. Receiving the motorcycles, the chairperson of the Commissioners’ Council, Mr. Milton Varney and County Superintendent, Madam Esther Walker hailed Vice President Howard-Taylor and said the donation was timely in helping district commissioners to follow-up on development projects and other administrative activities in the county.